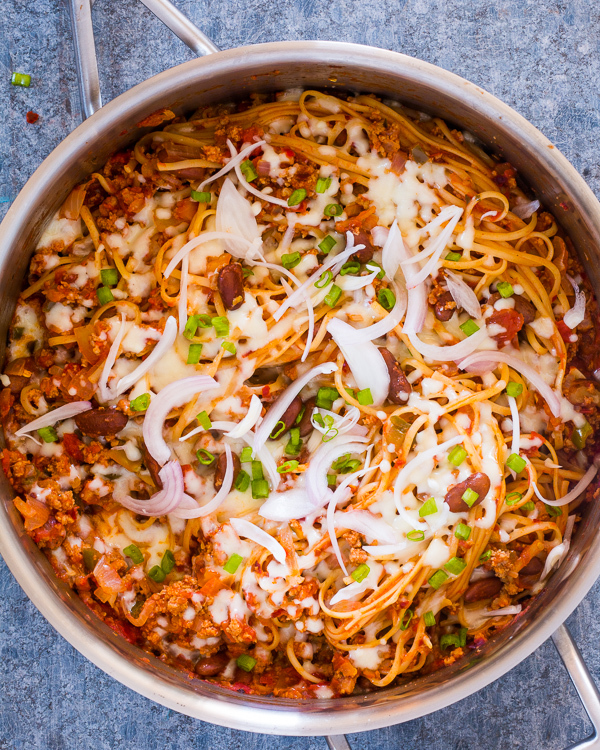 An incredibly delicious one pot recipe, this chili pasta skillet will remind you of your favorite chili recipe! All star mexican flavours in this easy pasta dinner. 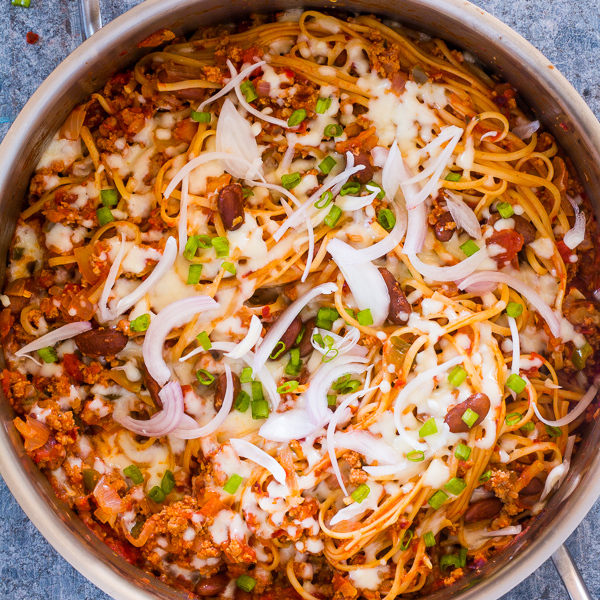 I’m officially in love with this one pot chili pasta skillet. And so is the husband. We polished off the entire skillet which actually serves 4 in one afternoon. And then felt really guilty after and ended up eating a salad for dinner. Guess we made up for it right? But that didn’t stop us from making it a second and a third time. In fact I’m making it again this weekend when we have friends coming over. Because good food must be shared and I know our friends will love this big one pot dinner. In fact every time I make one pot dishes with easy clean-up, I’m always asked for the recipe. 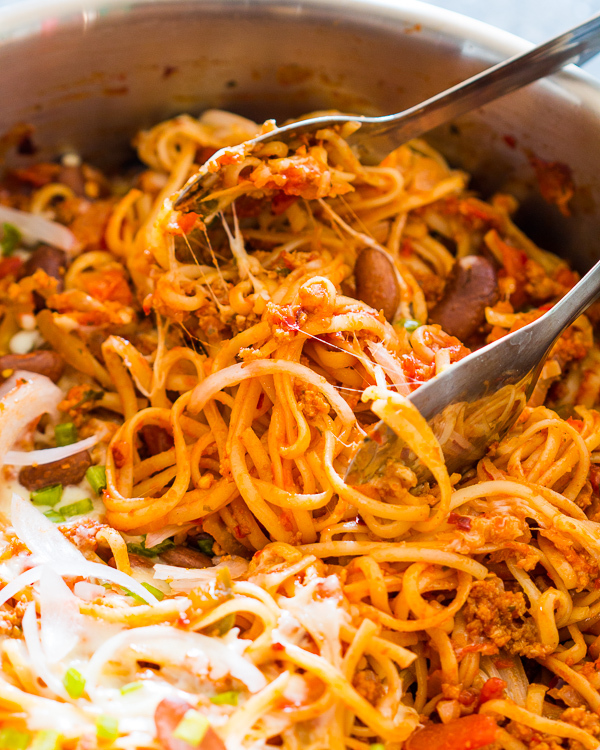 This chili pasta skillet really tops my list of easy one pot pasta recipes and I ain’t complaining because who doesn’t love a good chili, and combined with some carbs in the form of pasta noodles, you’ve got yourself a winner. We love topping ours with lots of sliced onions, some avocados and even cilantro sometimes. And it makes for fantastic leftovers. I just add a dash of milk or broth while re-heating to make it all creamy again! Heat oil in a large skillet and add onions and garlic. Saute the onions on high heat for a minute or two and add ground beef. Saute the beef till light golden brown. Add the can of chopped tomatoes, broth, chili flakes, cumin powder, chili peppers, beans and salt. Stir and bring this to a boil. Add the linguine and cover and simmer for 8-10 minutes till the linguine is cooked through. Top with shredded cheese and switch off the flame after a minute. Stir once, and serve hot.